Australia is a vast and diverse country in climatic terms. As a result, its agriculture/farming industry produces a wide range of commodities. Some 85,681 farming businesses contribute $56 billion to the country’s economy. The top three crop commodities are wheat; fruit, nuts and grapes; and vegetables. The most common livestock commodities are beef, dairy, wool and lamb. The country also has internationally renowned vineyards and fisheries. Australia has a rich farming heritage. Settlers from the First Fleet brought a handful of livestock with them, ready to make the most of the vast land available. Historically, Australia was been said to have ‘ridden on the sheep’s back’ for a long time. The wool industry dates back to 1797 when John Macarthur and Reverend Samuel Marsden imported Spanish merino sheep and it only grew from there, with wool becoming one of the most important industries for the Australian economy. Wars and economic problems meant the wool industry faltered in the early 1900s. By the time it recovered it had been overtaken by the cattle and wheat industries but the agricultural sector as a whole was booming again and it’s largely prospered ever since. Every generation of Australian farmers experiences its own challenges. For the First Fleet it was trial and error to find something that worked; for the early 20th century farmers it was war and a difficult economy that set them back. The unpredictability of Australia’s climate has forced farmers to be adaptable, resilient and resourceful. Small wonder that many seminal agricultural inventions emerged from the island-continent. The 1840’s Ridley Stripper, for instance, removed heads of grain, with threshing done later by a different machine, while the stump-jump plough helped farmers prepare mallee lands for cultivation. Two thirds of Australia’s land is used for farming production, with commodities chosen largely dependent on typical rainfall. While cattle and sheep grazing suits the arid and semi-arid areas, the dairy, timber, sugar, fruits and vegetables industries are typically concentrated in the coastal regions. Even so, choosing a location based on rainfall alone does not always guarantee the perfect farming climate. Water scarcity has been a perennial problem, even in areas of higher average rainfall. Harsh droughts have persisted for years on end, yet devastating floods have also been known to wipe out crops in a matter of days. As climate change makes weather patterns even more extreme, these problems are sure to become more challenging. While 2016-17 has been a bumper year, with record production, exports and profits, the long-term trend is more concerning. Changes in climate have cut potential Australian wheat yields by around 27% since 1990, according to CSIRO modelling. Driven by changing rainfall patterns, global wheat yields fell by around 5.5% between 1980 and 2008, with declines in winter rainfall in southern Australia hitting broadacre crops like wheat, barley and canola. As the population of Australia – and the world – continues to swell, farmers today are preoccupied with increasing production levels in an increasingly difficult climate. But efforts to deploy more environmentally sustainable farming practices at every stage of production are driven not just by concern for the planet but the bottom line too. "Costs like fuel and labour, techniques they're using like no till, precision agriculture, what underlies those is much more efficient use of time, labour, fuel, machinery costs," John Kirkegaard, a farming systems agronomist at CSIRO Agriculture, told ABC News. Wheat farmers have doubled water-use efficiency, according to the Australian Export Grains Innovation Centre (AEGIC). During the 2000s conservation tillage, where a previous crop’s residue is left in a field when planting a new crop, was widely adopted. Farmers are having to reconsider what they produce and where. Consider the shift of wine grapes into Tasmania as temperatures rise, for instance. Good physical health. Being a farmer is a tough, physical job with long hours spent doing physical work, exposed to sun, rain, wind and other elements. You need to be in good physical condition and be up for a not inconsiderable physical challenge. Rural experience and/or agricultural knowledge. Whether its previous employment in the industry or a childhood spent on a farm, some sort of experience in the sector is, if not essential, hugely beneficial. At the very least you should get some qualifications in the field – or find a business partner who does know the sector. AustralianUniversities.com.au has links to agricultural courses around Australia. Passion for the job. With early mornings and long hours, farming is an all-consuming business, usually conducted far away from the amenities of big cities. If you’re going into the business primarily to fund an exciting social life, you’re making a big mistake. Patience and prudence. Farming is subject to the mother of all factors beyond an entrepreneur’s control: the vicissitudes of nature. Then there are the wild fluctuations in international commodity prices – particularly important if you’re reliant on exports. You need to play the long game because your fortunes can ebb and flow from year to year. Keeping some cash back in the good times to see you through bad harvests is wise. Capital. If you’re going to buy a farm then you need to think long and hard about the costs involved – from maintenance costs to paying employees. The costs are not inconsiderable and revenues unpredictable, given the volatility of harvests and global commodity prices, so factoring in a decent safety margin is advisable. Business acumen. Surely this would apply in any sector, you might think? Of course, but it’s worth reminding yourself that for all the long days out tilling the fields or caring for livestock, you’ll still need to do all the things that other businesspeople do: marketing, meeting suppliers, paying employees and of course paying tax, taking care of accounts and dealing with other paperwork. 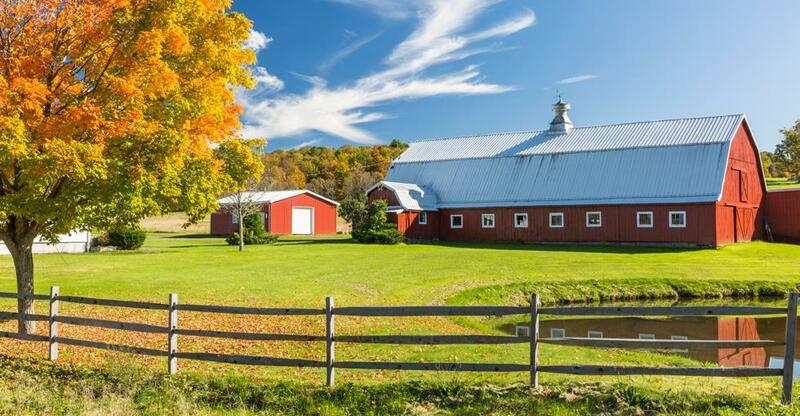 Still interested in buying a farm? Take a look at our farms for sale.